Tiny, juicy sweet cherries are a great healthy snack and skin rejuvenating food with the highest levels of antioxidants of all fruits. These delicious fruits with a deep lustrous red color we often come across in desserts, might just be more for you than you think. Sweet cherries have a high-water content, nearly 75 percent and two powerful antioxidants isoqueritin and queritrin. Sweet smelling cherries are an effective beauty home remedy for skin conditions like acne and rosacea, and they can act as a great skin cleanser. Regular consumption of sweet cherries also protects your skin from ultraviolet rays and decreases damage caused by free radicals. Sweet cherries are excellent sources of nutrients, vitamins, minerals and antioxidants, on which the health of your hair depends, because of that they are a great home remedy for split ends and hair loss. 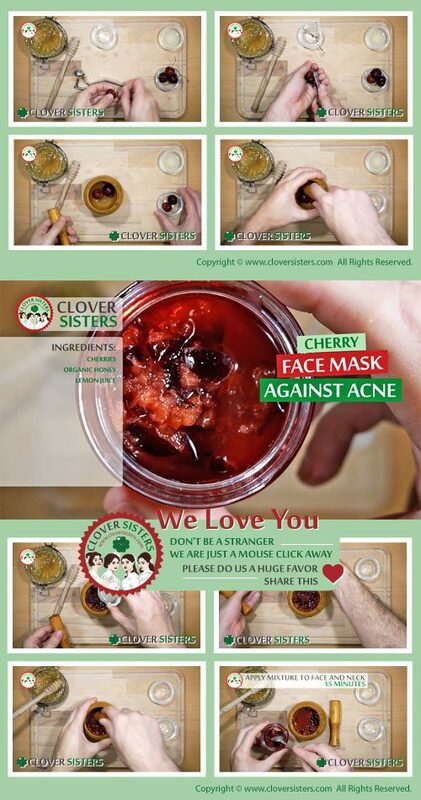 Take advantage of cherry season and help your skin. Mix few mashed cherries with teaspoon of organic honey and teaspoon of lemon juice. Apply mixture to face and neck and leave it on for about 15 minutes. Rinse it off with lukewarm water.